Marketing is a wonderful thing. Give something a catchy name and it can take off (ShamWow, anyone? ), even if it doesn't properly describe the item in question. 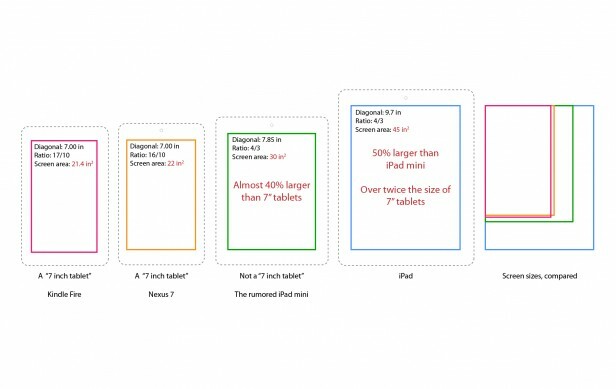 At 8 inches (Ahem, 7.9), the Mini is bigger than a large proportion of tablets out on the market these days. But by shaving off that 0.1 inch, they still qualify to call it a 7-inch tablet. In case you can't read it: the Kindle Fire is 21 sq in, Nexus 7 is 22 sq in, the iPad Mini is 30 sq in. In fact, this calculation was done before it was announced as being 7.9 not 7.85 inches, so it's actually bigger. The biggest 7 inch tablet of the three. By far. It's no Galaxy Note (now that could qualify for a mini tablet title). When you look at it that way, the iPad Mini isn't that mini after all, is it? Ah, marketing. A wonderful thing.